Over recent years, i-vector based framework has been proven to provide state-of-art performance in speaker verification. Most of the researches focus on compensating the channel variability of i-vector. In this paper we will give an analysis that in the case that the duration of enrollment or test utterance is limited, i-vector based system may suffer from biased estimation problem. In order to solve this problem, we propose an improved i-vector extraction algorithm which we term Adapted First order Baum-Welch Statistics Analysis (AFSA). 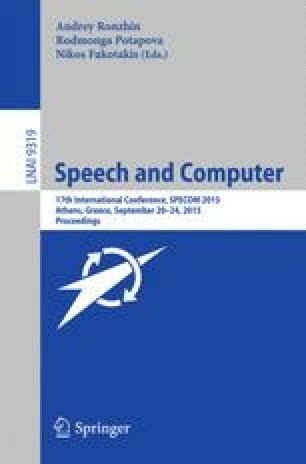 This new algorithm suppresses and compensates the deviation of first order Baum-Welch statistics caused by phonetic sparsity and phonetic imbalance. Experiments were performed based on NIST 2008 SRE data sets, Experimental results show that 10 %–15 % relative improvement is achieved compared to the baseline of traditional i-vector based system. This article was supported by the National Natural Science Foundation of China (NSFC) under Grants No. 61271349, 61371147 and 11433002.